Rift Valley is Kenya’s largest and most populated province. Its capital is Nakuru. Millions of years ago, the Earth’s crust tore itself apart and created a jagged trench running 6,000 kilometres across what is now the African continent. The Great Rift Valley, as it is called now, is as wide as 100 kilometres in some areas and as deep as 1,900 kilometres in others. The province was named after it. The valley divides Kenya in half, separating east from west. The land on either side of the rift is distinguished by sharp volcanic mountains, hot springs and alkaline lakes. The valley floor is a low, flat arid plain characterized by unliveable deserts and rich farmlands. The latter make this the most economically vibrant part of Kenya. There are lush highlands near Kericho that are used to grow tea, while fertile farmlands bring nourishment to the cattle raised in many parts of the valley. Numerous tribal communities live in the Rift Valley. Notable among these are the Maasai people, the most recognizable cultural face of Kenya. Life in this province is mostly rural, with towns and cities popping up all over the region, though we may soon see a shift to urban living. The busy college town of Nakuru is Kenya’s fourth largest city and the capital of the Rift Valley. There are several centres of higher learning here, including the large public school Egerton University, the private Kabarak University, the Rift Valley Institute of Technology, the Kenya Institute of Management and the Kenya Institute of Biomedical Sciences and Technology. 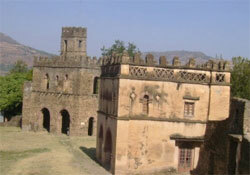 The town’s economy is driven by agriculture, dairy farming, manufacturing and tourism. Nakuru’s farms range from small holdings to large businesses, growing a variety of crops, including wheat, barley, maize and coffee beans. Nakuru has a large public market where many of its crops and produce are sold. The town has all the services and facilities a modern town would have, from medical centres and banks to supermarkets, hotels, restaurants and shops. One of the most important anthropological and archaeological sites in Kenya is Nakuru’s Hyrax Hill reserve. It was excavated by Louis and Mary Leakey, and contains Neolithic settlements and tombs. At one end of the town is one of the Rift Valley’s soda lakes, Lake Nakuru. Around it is the Lake Nakuru National Park, a reserve blessed with an abundance of natural beauty, from the flocks of flamingos that make the shallow lake their home to the vast, wooded caldera of dormant Menengai Volcano, the second largest volcanic crater in the world. Section 58—pronounced “five eight” by residents—is a well-off, upmarket community in Nakuru near the shores of Laku Nakuru and on the outskirts of the national park. The slopes of the Menengai Crater are in the distance. Section 58 is also close to Nakuru’s State House, where high officials including the President stay when they are in the area. Section 58 has a number of Asian and expatriate residents. Lake Elementaita is close to Nakuru, Kenya’s fourth largest city. It is home to hundreds of thousands of wading birds, including a mass of flamingos that colour the horizon pink, and other kinds of African wildlife, such as gazelle, eland, zebras and warthogs. Near the lake are the Kekopey Hot Springs, popular with tourists. An ostrich farm and a commercial centre are nearby. 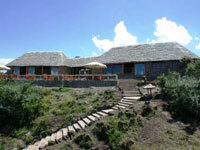 Visitors to Lake Elementaita can stay at the two tourist lodges by the lake, or at any of the hotels in nearby Nakuru. The Kariandusi archaeological dig near Elemtaita unearthed an important cache of stone axes and cleaver. The Paleolithic site was excavated by Louis Leakey in 1928. Kariandusi is also a mining area. Lake Elementaita is less than two hours’ drive from Nairobi. Naivasha is a market town in the Nakuru District on the shores of Lake Naivasha. It lies halfway between Nairobi and Nakuru, along the highway between the two urban centres. Naivasha is the gateway to several tourist spots, including Longonot National Park, Mount Longonot and Hell's Gate National Park. There are visitors’ lodges and a country club near the shores of Lake Naivasha, which is home to several species of African birds and other wildlife.